Dr. Manash Ranjan Sahoo is a renowned General Surgeon in Ranihat, Cuttack. He has over 29 years of experience as a General Surgeon. He is a qualified MBBS, MS (General Surgery) . You can meet Dr. Manash Ranjan Sahoo personally at Orissa Nursing Home in Ranihat, Cuttack. Don’t wait in a queue, book an instant appointment online with Dr. Manash Ranjan Sahoo on Lybrate.com. Lybrate.com has an excellent community of General Surgeons in India. You will find General Surgeons with more than 44 years of experience on Lybrate.com. 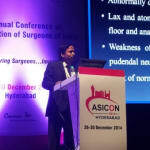 You can find General Surgeons online in Cuttack and from across India. View the profile of medical specialists and their reviews from other patients to make an informed decision. There is black patch (jhaeeyan) on my face. That occurred because of tension how can I get rid of it. please suggest me any cure. Increase intake of water. Do deep breathing exercises and take lots of fruits and vegetables to have antioxidant properties. I m 22 year old girl. On mY face wrinkles n blackheads. please give solutions for clear n glowing face. Hello. The following tips would help you to reduce wrinkles: 1.Avoid the sun. Apply a good sunscreen with SPF-30 and apply a good moisturizer before application of sunscreen. 2.Don't smoke. Cigarette smoke ages skin -- mostly by releasing an enzyme that breaks down collagen and elastin, important components of the skin. 3.Get adequate sleep. When you don't get enough sleep, the body produces excess Stress Hormones, a hormone that breaks down skin cells. Get enough rest and you'll produce more Happy Hormones, which helps skin remain thick, more elastic and less likely to wrinkle. 4.Sleep on your back. Sleeping on your side increases wrinkles on cheeks and chin, while sleeping face-down gives you a furrowed brow. 5.Wear sunglasses. It will protect skin around the eyes from sun damage. 6.Eat more soy. The soy has properties which may help protect or heal some of the sun's photoaging damage. Soy-based supplement (other ingredients included fish protein and extracts from white tea, grapeseed, and tomato, as well as several vitamins) improves skin's structure and firmness. 7.Eat more fruits and vegetables. They contains antioxidant compounds which fights damage caused by free radicals (unstable molecules that can damage cells), which in turn helps skin look younger and more radiant, and protects against some effects of photoaging. 8.Be Happy. Last but not the least, if you are genuinely happy that would reduce the levels of stress hormones in your body which is responsible for tissue damage! Use Bakson’s Papaya Pack and Anti-Wrinkle cream regularly. For Blackheads: Blackheads are initial stage of acne. Wash your face with Schwabe's Akne Sor soap, use cleanser, toner and moisturizer on your skin. Apply Bakson's Sunscreen before going out. Use Bakson's Apricot scrub on the areas, followed by Papaya or Apple pack on it. Hi I have skin problem. Between my legs skin get aged and dry. Color also changed. Have little itching also. Is it curable? Hello. My skin is very oily and I am suffering from acne. Please tell me any best face wash which cleans my skin and make it spots free. I have used many face wash but not recommended by any Dr. Please tell me any best face wash which lightens my skin. Thanks. I have accidental scar on my nose and cheek. Please suggest me how to get rid of it. 1. Apply a tablespoon of apple cider vinegar directly on the scar. 2. Gently massage the area so that the apple cider vinegar can be absorbed fully by the scar. 3. Allow the apple cider vinegar to dry up on its own. 4. Once you are sure that it is dry, repeat the process. 5. This can be done several times. Results can be seen after about a month of doing this process every day. Hii I hv so much dark spots on my face n acne prone skin please suggest me some effective medication. My forehead skin is getting dark as compared to chin and other parts of my face. Can you suggest some ways? Hi. You have to follow some basic things so that you get better results in a short period of time. 1) drink only 100-150 ml of lukewarm water during meals, 2) don’t drink water before meal for one hour and one hour after meal, 3) avoid oily, spicy, junk, fermented and stale foods, 4) sleep upto 10.30 pm, 5) avoid coffee and tea, A) use evenshade cream of charak pharma, B) take 30 ml of AUDUMBARAVLEHA before meals, C) take ½ tsf of nimbadi churna after meals, Do all things for 30 days. Gives you good result. THANKS. Actually I have little facial hair and lot of dark circles and spots on my face. How to remove or reduce it. Hello, There are few tips or home remedies which will help to get rid of your unwanted facial hair: - Take Safflower Oil (Kusuma Oil) and Thanaka (yellowish-white cosmetic paste, available in ayurvedic stores). Remove unwanted hair either by using hair removal cream or by shaving. Take some Kusuma oil and grind Thanaka in it. Prepare a paste. The thickness of the paste should be similar to hair removal cream. Apply it on hair removed areas. Massage until the skin pores absorb it. Leave it for 3-4 hours. (You can also apply it at night, before sleeping). Wash with water. Use this method continuously for 100 days. You will get rid of unwanted hair, permanently. -One of the reasons for unwanted hair growth in women is the excess levels of testosterone (a hormone). Spearmint tea helps in reducing the level of this hormone, thereby decreases the growth of unwanted hair. -Take dry turmeric, leaves of Acalphya indica (Khokli or Kuppi) and neem leaves. Grind all the ingredients. Prepare a paste. Rub it on the face, before sleeping at night. At morning, peel off the dried mixture from your skin. Use it regularly. Eventually, it will remove undesired hair. Medication: Schwabe's Oleum Jacoris 3x/ 3 times a day for a month. For dark circles: Common reasons for dark circle are aging, genetics, nutritional deficiency (of vitamin A, C, K, E) , sleep deprivation, worm-infestation, anemia, smoking & drinking, dehydration, sun exposure, allergies, stress/ tension and hormonal changes. Research also suggests that dark circles are linked to anemia, and liver diseases. So, in case of dark circles which are there due to some underlying cause can be get rid rid of once the causative factor is rectified. But the dark circles which are inherited from our genes can't be removed completely, to some extent can make slightly better. Diet and Management: Thus, always take a balanced diet rich in green leafy vegetable, dairy products and all types of fruits to keep your body healthy. It is advisable to have at least 10-12 glasses of water and include fresh fruit daily. It is also advisable to restrict the intake of caffeinated drinks such as tea, coffee, alcohol and other caffeinated drinks as it aggravates dehydration. Take enough of 6-8hrs. Of sleep. Avoid taking stress/ tension. Do daily exercising regularly as it increases oxygen carrying capacity of the cells and tissues. Medication: Take homoeopathic medicines – Schwabe's Cina 1M/ one dose at night for 10 days; Alfaalfa Tonic and Five Phos. - both twice daily for 20 days. Revert me back there after. I have a problem on forehead i.e Dark head (or) dark spots on my head. How can I get rid from this. Happiness from inside and taking nutritious, healthy food and daily yoga or some kind of exercises, it will be automatically reflected on your face. Apart from these, you do follow CTMP, i.e., cleansing, toning, moisturising and protection (apply liberally sunscreen with SPF-30) after washing your face daily; use the products as per your skin type. This will change the skin texture and skin tone. In case you do have tanning, apply honey with a dash of lime on your face. You can also use homoeopathic cream - Medicynth's Whitch Hazel daily at night. If the dull skin tone is due to any underlying ailment or diseases, need to look into the matter! Botox & Dermal Fillers - The Secret Weapons For Skin Rejuvenation! With age, the skin begins to deteriorate and gradually lose its function and appearance. The underlying layers of collagen, which give it the firmness and elasticity begin to gradually break down, leading to sagging of the skin, dark spots and pigments, and dull, lusterless skin. Aging occurs at different rates from person to person. It is related to a combination of loss of bone, fat, collagen and elastin, each of which is related to genetics and environment. This causes cosmetic and psychological concerns, given that most people (especially women) become extremely conscious about these and want to avoid these ageing effects of skin. Over the past few decades, skin fillers and Botox have begun to play a major role in skin rejuvenation, especially from the various ageing effects. Let us look at these two methods and how they have worked their magic around skin care. Botox: The neurotoxin from botulinum A was actually used for treating muscular disorders to cause paralysis and prevent repeated twitching. However, it was later realised that the same effect could be used in skin to reduce ageing effects. Used commonly in the crow’s feet area, forehead and frown lines, the injected Botox causes paralysis of the underlying muscles. This reduces the muscular activity and so the muscles relax and soften. This produces a younger looking appearance. In addition, these paralysed muscles also give some time for the elastin and collagen to recover. The Botox injections are usually done in the outpatient setting and require about half an hour to an hour. The areas for injection are marked and after the procedure, the patient can go back to regular schedule, including working. It might require repeat injections, about 4 to 6 months later, depending on how well the skin responds and the expectations of the patients. Fillers: Another routinely and commonly used way to manage wrinkles are the dermal fillers. The elastin, collagen and hyaluronic acid in the skin are lost with age and these filler injections replace the lost substances in very quick time and thereby restore youthful skin quickly. Unlike Botox, the muscles are not touched. There is a loosening of the collagen and elastin, which produces loose skin and sagging. The fillers occupy the space left behind by the lost collagen and elastin and actually ‘fill’ up the extra available space. This gives a firmer, younger looking skin. The lines and creases are actually eliminated. They can also be used to produce thicker lips, lifting cheeks and plumping temples. So, if you are worried about ageing effects of skin, talk to your dermatologist to find out if Botox or fillers can do the trick for you!! In case you have a concern or query you can always consult an expert & get answers to your questions!